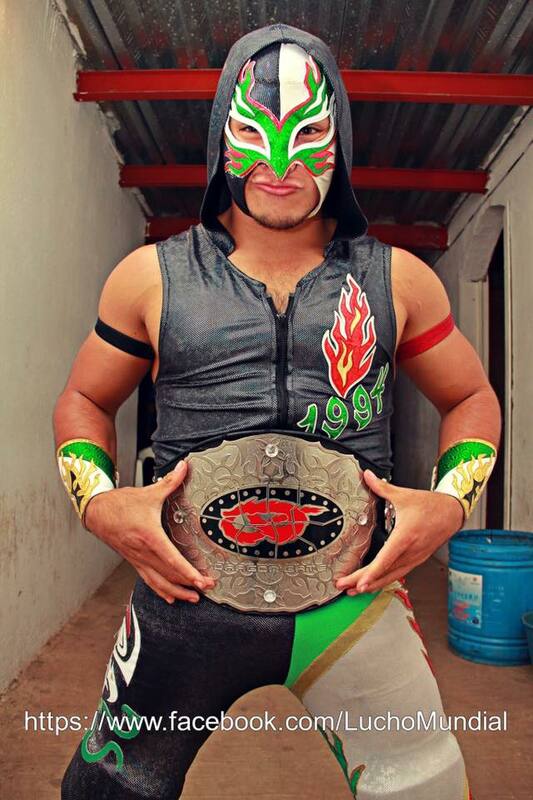 The luchador best known as Flamita announced on his personal Facebook today he was returning to being an independent. He stated he was giving up the Octagon Jr. identity and his association with AAA, and returning to his own name. The bulk of the short post was about the recent incident of Octagon unmasking then Octagon Jr. at an autograph signing. It’s the first time he’s talked about it publicly Flamita says he respects Octagon, but Octagon’s problems were with AAA and should’ve stayed that way. Flamita understood the consequences of his actions (taking on the Octagon Jr. name) but feels himself and his fans deserved respect. Flamita goes onto say he believes he has the talent to make it on his own name in lucha libre, and so is returning to his old name and leaving AAA. Flamita thanks AAA for giving him the opportunity and wishes them success in the future. 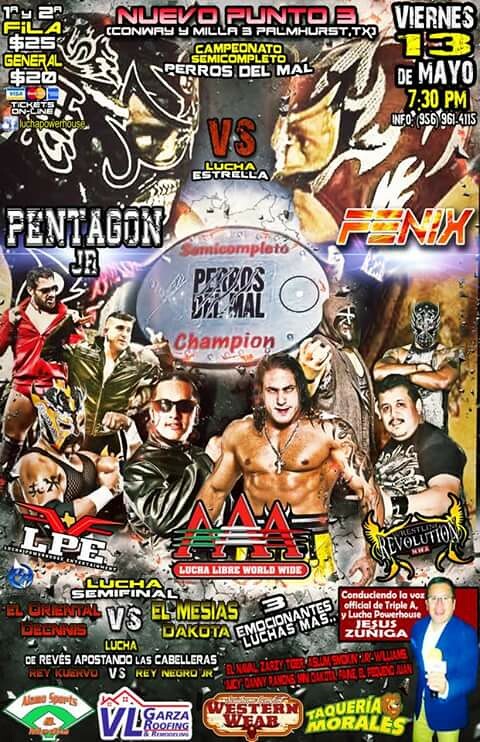 Flamita says he’s independent as of today, which suggest he may not be going thru with the rest of his AAA bookings. He’s currently listed on shows all the way thru May 27th, though Friday’s TV taping is not on the list. Octagon Jr. was not involved in any AAA storylines. Octagon Jr. had a reasonable chance of being included in the Lucha World Cup in some fashion as a way to spotlight the new character – we have no idea how much of that was already decided, but maybe it’ll need to be changed. AAA has said nothing about the situation. My (limited) information is there had been some meetings between Flamita & AAA leading up to this – I think this is Flamita getting out of his AAA deal with AAA’s knowledge and not just unexpectedly quitting, but no one’s confirmed that to me. This reads like it’s more about Flamita wanting freedom and the benefits of not being tied to a promotion. He’s a very rare young luchador who’s got some name value without being a regular on TV, and it’s may be that he was doing better for himself as Flamita than on an AAA schedule as Octagon Jr. The controversy over the Octagon Jr. name seems to have played a part in his decision, but it comes off as if Flamita would’ve just rather been Flamita than Octagon Jr. all along. It made sense for AAA to want an Octagon Jr. and Flamita was as good a choice as any – Octagon (Jr.) is easier to sell to promoters aiming at casual fans, which means AAA makes more money off using him – but AAA had not used Octagon Jr. in any meaningful way since his debut. Flamita had meaningless TV roles in second and third matches, Octagon Jr. was used in TV meaningless roles in fourth and fifth (and an PPV opener), and the consistent part was the meaningless of it all. They were adding any value to him. Flamita wasn’t a young guy who was getting his first real shot, he’s a young guy who was getting big spots (in smaller promotions, and one that is at least around the same size) and has been around enough to know the difference. There had been recent hints in social media that something was up between AAA and Octagon Jr. It’s very possible the Octagon unmasking moment started everything rolling, but the relationship between AAA & Flamita has been challenging all along. AAA had tried to bring Flamita back in as long as ago as 2014 before finally getting him in 2015, and even then it seemed like it took a while for everyone to agree on deal for Flamita to come in full time. Flamita doesn’t turn 22 until November, so his and AAA’s paths are likely to merge again if he continues in lucha libre long enough. (AAA’s surely very unhappy about how this all went down, but have shown the willingness to get those feelings if the deal is right.) Hopefully it’ll go smoother next time, though next time may be a long time away. In Mexico, Flamita will immediately start working for CaraLucha. They’ve announced him as part of the 05/21 Anniversary show. There’s a decent chance he’s meant to be Mascara Dorada’s opponent for that show. I expect ever Mexico indie will try to use him, just as they did before he signed with AAA. US booking of lucha libre talent has picked up in the last year and there’s a good chance he’ll turn up there as well. Flamita also makes sense as independent luchador on ELITE shows – though if AAA has any ability to stop him from working places, that would be the place they’d pick. There is also going to be guessing about Flamita being involved in WWE’s Global Cruiserweight Series. Flamita’s goals of being independent and tease of going to Japan suggest that’s not his plan, but this story has taken so many twists and turns that it’s hard to rule anything out at this point. There’d be a great irony of one Octagon Jr. following the same path as the original Octagon Jr. if it happened, but I don’t think that’s what is going on here. The original Octagon is declaring total victory, congratulating Flamita for seeing the errors of his ways. That’s not exactly what Flamita is saying, but Octagon is getting everything he wants and will chalk this up as a victory. That’s a depressing part. (Octagon and Flamita now inevitably meeting at an indie show will be the interesting part.) It may be a short lived one. AAA seemingly stuck someone new in the Bengala outfit just to prove some point and keep the character alive. There’s a good chance we’ll see an Octagon Jr. III before long. The reasons for AAA to have the character remain the same, and it doesn’t require a super luchador given how if he’s just going to be used the same way as Flamita. There’s going to be no shortage of people who would take the character Flamita didn’t want, no matter how it makes Octagon feel. The fight between AAA and Octagon is not over, it just may go quiet for a while. There’s one more aspect to this, but I’ve left it to last because it is a Lucha Underground spoiler. You may want to turn away, but it’d be silly not to talk about. This turns into a digression too, so you may best to avoid it. Lucha Underground wrestlers are typically required to sign contracts with the promotion that forbid them leaving for many seasons. It’s why King Cuerno is still in Mexico City and not Orlando. Flamita surely had to sign a similar contract, but he appears not bound the same way. Maybe more will come out this later, but I’m tempted to believe Flamita isn’t still under LU contract, past whatever end of season no-compete there may be. Night Claw has not appeared on any season 3 tapings, and Flamita hasn’t been in dark matches. That character might have been written out already in some way we don’t yet know – they’ve certainly treated him like he doesn’t exist in this set of tapings. Despite Striker noting the cage matches were originally designed to keep the wrestlers in and everyone else out, Taya interfered often in the opener. She blocked Cage’s path from escape a few times, snuck weapons in and eventually climbed in herself when it was going bad enough for Mundo. Johnny needed the help. Mundo did pass up a chance at escape for a – missed – top of the cage Fin de Mundo variation on Cage, but took the worst of the battle. Taya attempted to handcuff Cage to the cage, but was trapped in the handcuffs herself and Cage dropped Mundo with the Drill Claw screwdriver on a chair to win. The first team was eliminated when Cortez refused to tag Joey Ryan back in to face Ivelisse. Ivelisse had just gotten the better of Ryan, so Joey wanted revenge and Cortez had good reason not to let him in. Cortez immediately being cradled and beat by Ivelisse made it seem like a very bad decision. The two police officers continue to not get along. Ivelisse & Son of Havoc eventually lost out due to the numbers. Fenix took out Son of Havoc by knocking him from the apron. Ivelisse had Jack beat with the same Code Red she used to defeat Kobra Moon, but PJ Black was able to kick her and turn over the pin with no Angelico to stop him. Mundo’s dive off the top of the cage was tricky, but I was most impressed by Cage catching the cane! Fenix was a little bit more rudo in the final, but the Mysterio, Puma and Azteca team was just way too much for the competition. Puma & Dragon took out Fenix & Black with dives as Rey got the pins. Mysterio’s team are the fourth champions. In a show closing scene (and one that was seemingly supposed to take place some time after the match ended), Vampiro met Pentagon Jr. in his evil dojo. Pentagon is in a motorized wheelchair. Vampiro ordered Pentagon to stand, but he couldn’t. Vampiro poured hot wax on Pentagon and knocked over his wheelchair, but Pentagon still couldn’t get up. I liked the action on this show. Both these matches were fun, and it was as good an all action show as some of the best ones they’ve had. The cage match turned an impressive showcase for Cage by the end. Cage took all the cheating and tricks Taya & Mundo had, and still completely and clearly defeated Mundo at the end. The metric ton of interference got to be a bit much, and would’ve really been annoying if it worked and this was going on and on. Instead, this felt like the usual bit of a Lucha Underground gimmick match being the end of a feud, Cage got his big move, and Mundo is going to have to come up with yet another way to finally win a belt here. The four way match was a dizzying at first. Striker emphasized how hard it was to call and it was a just about as hard to follow with all four teams in. Getting the Crew & Ryan out of there helped, and they did it while following up on their own story (and playing off the not acknowledged story of Joey versus woman.) Ivelisse & Havoc have now lost the trios titles twice when a team member was too hurt to go on – they’ve got as much bad luck as dysfunction, and they smartly played off that in their elimination. I could’ve gone for much longer with the final two teams (in particular, 15 seconds of Dragon Azteca versus Fenix made me want 15 minutes of Dragon Azteca versus Fenix), but that segment and the ones prior had a crazy amount of huge spots. This is the most GIF-able wrestling show in the US, and that was a main event of non stop GIFs it ought to have been. The closing segment takes a bit of faith, or some reading ahead. Pentagon looked far weaker here than he did against Matanza. Pentagon isn’t going to be in that wheelchair and he’s not going to get wax poured on him forever. They’re putting Pentagon at a low point so we can watch him climb back up again. I’m just not really sure Pentagon was in need of a tear down and build back up or a softening. He was up pretty high! Maybe this might also be read as just as something to keep him on a side track while he’s not in the title picture – something along the lines of Dragon Azteca and Black Lotus training for weeks. I’d just be as ok with more Pentagon Jr. matches. The good thing is there eventually will be a payoff to the Pentagon Jr. stuff, and – as seen with both of these matches – the Lucha Underground payoff matches are usually a lot of fun. What happened: La Parka beat Texano cleanly in the main event. Cage & Mesias, new Trump buddies who were justifiably upset about that ludicrous result, destroyed Texano and gave him a martinete. A new Bengala debuts, though we’re supposed to be under the impression it’s the same Bengala and a new Ricky Marvin (who really is supposed to be part of a maybe named Averno/Chessman faction.) Venum and Apache have issues, but they didn’t go anywhere. What was good: First two matches had some good moments. Main event was an angle and not a well done one. 12:08. Mephisto casually pulled off Dorada’s mask in the first fall, then won the second with a powerbomb. Dorada made a big comeback in the third fall but was put down via Devil’s Wings in the third. Mephisto asked for (another) title match next week and Dorada accepted. I didn’t realize it was an al rudo night until putting together the results. It was a very long show – shows don’t feel long when the matches are good, and the matches in the undercard weren’t very good. I didn’t understand why they added a sixth match to this show and it was less clear when the main event didn’t start until about 2 hours and 15 minutes into the show. Main event was good, and parts of the ciberentico were good. Eric has a preview of tonight’ show. We’re all kind of waiting for info on May’s Lucha Underground tapings, which wrap up Season 3. The tapings were reported to be on May 7th & 8th and May 14th and 15th. Those last two dates have been mentioned in some of the ticket contest giveaways they’re doing as well, though LU still hasn’t announced them. I’ve actually been hoping to get tickets to the latter ones for a while – I think I can get to LA that weekend, and thought those shows are probably Ultima Lucha 3 – so I’ve been more focused on the tickets than usual. The tickets are usually offered by a couple weeks before the show and it’s a little strange they’re being held back. This is yet another ‘maybe it’s nothing’ thing, but I was reminded yesterday there’s also a date conflict: May 14th is also the AAA taping in Orizaba, which has been pushed on TV for months and the poster includes people who would be expected to be in Los Angeles at the same time. Maybe either LU or AAA has to move, or some fancy planning has to be done to get people in the right place on the right day and that’s the hold up. Pentagon Jr. & Fenix are also listed as wrestling on May 13th in Texas; LU often has guys come in a day ahead of time for their tapings so that’s unusual. Speaking of date conflicts, CaraLucha announced their 2nd year anniversary show will take place on May 21st. Mascara Dorada is the first luchador announced for the show. The full card will be announced next week. That announcement has the unintentionally effect of confirming Mascara Dorada will not be participating in NJPW’s Best of Super Juniors tournament, because it also starts on May 21. Dorada had said for quite a while that he had not heard from NJPW when/if he’d be returning, but I kept assuming he was either not telling the whole story or NJPW would just be getting to him before the tournament. Guess not. In his regular podcast, KUSHIDA also confirmed Kamaitachi would not be part of the tournament this year. (Kamaitachi’s busy in ROH instead.) Dragon Lee does appear to be going – he said many months ago that he had big news he couldn’t talk about – but it’s unclear if CMLL will continue to have two representatives (Cavernario?) or just the one spot this year. The tournament will probably be announced on NJPW’s 05/03 show. Today’s two Liga Elite matches are Lashley (1-0) versus Ultimo Guerrero (0-1) and Volador Jr. (0-1) versus Mascara Dorada (2-0). Guessing Lashely strong as the outsider, and Volador stops Dorada’s win streak. The semimain is the Parks (Hijo, Super, LA) versus Ingobernables (La Mascara, Pierroth, Rush), in a match which will make me regret watching this show ‘live’ late Friday night. Black Warrior & Blue Panther versus Solar I & Hechicero sounds like a good match which will be condensed to about 20 seconds on TV. Video of the famous Brazos versus Villanos triple mask match has turned up on YouTube. The video degrades to more of a slideshow at times, but it’s the first time the entire match has made it online as far as I know. RobViper has a music video of 09/20/15 AAA. I’m thinking of going to this lucha show in Milwaukee Saturday. It’s a 100 minute drive, but Bestia 666 versus Rey Horuz sounds great. This is also the first lucha show I have in the database from Wisconsin, which means I’m missing a few. The Atlantic has a video feature on La Luchadora, the documentary on Luna Magica. Faby Apache is happy to team with her sister again. Avispon took Despiadado’s hair in Arena Aficion. The lineup got up about 24 hours before the show. Oh well. As usual, it’s children going to wrestling show season, so minis are back in IWRG. Really hoping Impossible/Freelance turns up. 2) Oro Jr., Pegasso, Soberano Jr. vs Espíritu Maligno, Rey Apocalipsis, Toro Bill Jr. They had this match once at the end of the Domingo Elite shows, with Caristico winning. Caristico’s been pretty good, and it’s a test of how well Mascara can do as a rudo. Semimain is the rematch of the rudo/rudo trios last week. Second match might be good. It’s a little strange they’re repeating this title match so quickly. Dorada always wins the title match over Mephisto, but maybe this time it’ll be different. The women’s match in the fourth spot is higher than usual, but it’s more a case of having a bonus opener again. This is the second time Shocker’s been advertised here, and he’ll actually be able to at some point. Elite’s heavily pushed Rush versus Shocker, which is odd since that happened already and it didn’t go well for Shocker, but who knows. Cometa and Cavernario run into each other in the semifinal.